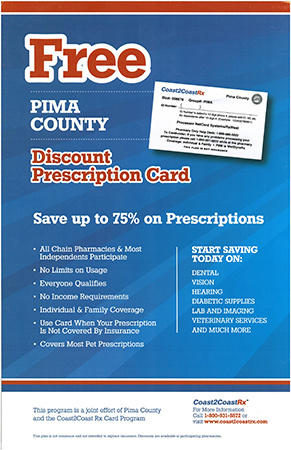 Pima County sponsors a discount prescription card designed to provide families and individuals with significantsavings on prescription drug costs. The Coast2Coast Rx card is available to all residents for free, regardless of age, health status or income. And while it is not insurance or designed to replace insurance, it is particularly beneficial for individuals with no or limited prescription drug coverage. The card offers consumers savings on a host of services, including dental, vision, hearing assistance, veterinary needs, diabetes supplies and even lab or imaging tests. The card, issued by Financial Marketing Concepts, is accepted at major pharmacy chains as well as most local independent pharmacies and includes more than 60,000 drugs in its formulary. Savings vary by drug and by pharmacy, but since the card launched here in August 2012, the average savings on purchases made in the Pima County area with the card is roughly 68 percent off the full price of prescription drugs. “With the growing cost of health care, this card is one more tool that may help individuals and families afford the medications they need the most,” says Supervisor Sharon Bronson. Those with health insurance may still find the card helpful, since it might provide savings on medications that are not covered by their health plan. Those with high-deductible plans may also find the card useful, since in some cases, the co-pay may be higher than the price of a prescription under the card. For more information and a complete list of participating pharmacies visit www.coast2coastrx.com.